There’s no place like your dream home. That’s what Grace and Joe Simcoe have found. When they were in their 50s, the couple decided they wanted to move from Baton Rouge to Lexington, Virginia, when they retired. 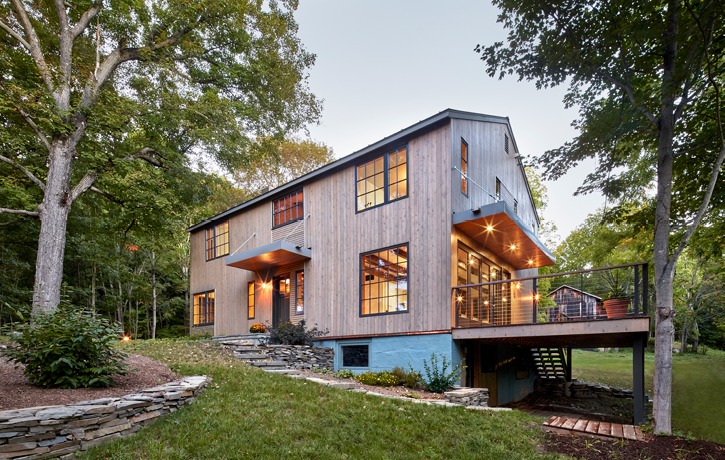 But they couldn’t find a house they loved, so they custom built their dream home in the Shenandoah Valley. Their 4,500-square-foot Prairie-style residence has everything they want at this stage of their lives: two huge porches with mountain views, a large kitchen with a cathedral ceiling and beams, a main-level master bedroom, and a comfortable guest suite. Your home represents you, says Baton Rouge-based architect Kevin Harris, author of The Forever Home. It’s where you invite friends and family. It’s where you go to rest at the end of the day. It’s where you recharge and find motivation to go back into the world. It becomes part of your identity, says Harris, the Simcoes’ architect. Government statistics show about 158,000 custom-built homes were started in 2015, out of the 713,000 single-family houses that were begun that year, according to the National Association of Home Builders. But not everyone starts from scratch. Some people renovate and add on to their current residence to create their ideal nest. Bruce Graham, a CAPTRUST financial advisor in Greenwich, Connecticut, encourages his clients to be realistic when building or renovating. Some people add extra rooms expecting their older parents to move in or their adult children to vacation with them, but that doesn’t always happen, he says. From an investment point of view, Graham reminds his clients that real estate prices are cyclical. “Many people think they’ll build it, and it’ll be an investment, but real estate has fallen in the past, and at times, it has fallen sharply,” he says. Graham also makes sure his clients aren’t over-invested in real estate. So if they have multiple homes, such as an apartment in New York City, a beach house, and a mountain retreat, then he advises them to adjust their investments in stocks and bonds accordingly, putting less money in real-estate-related securities. “Whether you’re building a $1 million or $10 million home, many of the issues are the same,” Graham says. “Often it costs more than you think, takes more time than you think, and is more stressful than you think. You will need to make a lot of decisions.” But for many, the joy of having something of their own creation makes all the effort worthwhile, he says. The Simcoes spent more than they expected, partly because they decided to upgrade many features. They didn’t want to cut corners in the place where they hope to spend the rest of their lives, Grace says. Jeri and David Kelly, both 65, of Baton Rouge, Louisiana, built a 6,000-square-foot Victorian Greek Revival house designed by Harris. The beauty of a new house is you can get the look of an older one without the maintenance problems, says Jeri, who previously remodeled two older homes. Before she starts a design, Khanani talks to her clients about their vision: how many bedrooms they need, whether they work at home, what hobbies they have, how much they cook, how they entertain, and if they expect aging parents will live with them at some point. “It gets pretty detailed,” she says. Some clients bring photos they’ve found online or in magazines or books. Often they have ideas for some of the finishes, and they may have an idea of some of the spaces they want, but they don’t usually have a layout and a plan, she says. “One of our clients came to us with 10 books on renowned architect Frank Lloyd Wright. They had marked pages and pages of houses that they loved. After talking with them at great length, we figured out the aspects of every one of those pictures that they liked. Without replicating it, we used those ideas to influence the design of their home,” Khanani explains. Clients often are interested in incorporating green and sustainable practices in their home, including using more efficient insulation and energy-efficient HVAC systems, Khanani says. Many people plan to remain in their homes for as long as possible, which Harris calls “grace in place.” To make that easier, doorways can be built wide enough to accommodate a walker or a wheelchair. “We can incorporate an elevator into the design or create space where we can add one later,” he says. Features that support aging in place have little impact on initial construction budgets, but their absence causes problems for people as they get older. Often clients want their dream house to accommodate their passions. For many that’s cooking and entertaining, so they build both outdoor and indoor kitchens. Harris recommends that the outdoor kitchen be located near the indoor one to reduce duplications such as having two refrigerators or freezers. People who are passionate about restoring old cars may opt for a shop where they can work. Avid gardeners may build a gardening shed or greenhouse, he says. Harris has noticed that his clients are more likely to use the exercise room if it’s accessible to their bathroom or master bedroom suite. In one case, the homeowner can see the door to his exercise room in his bathroom mirror. When custom building, it’s important to select the right builder, Harris says. Some aspects to consider: the contractor’s personality, reputation, experience, price, work quality, and ability to complete the project in a reasonable time.